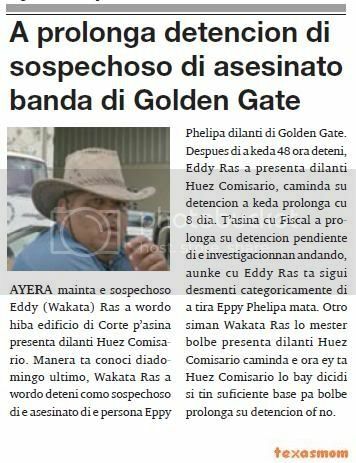 seems cu husticia is hand at cabez, because till still the sospechoso, eddy “wakata” ras, the cuidador of preso, cu is deteni, not owing to admiti of owing to throw guiseppe arend phelipa kill diadomingo ultimo fast of golden gate. the mature cu past owing to stay deteni, is because in golden gate they two will had one discusion, cu did take lugar fast of several witness. 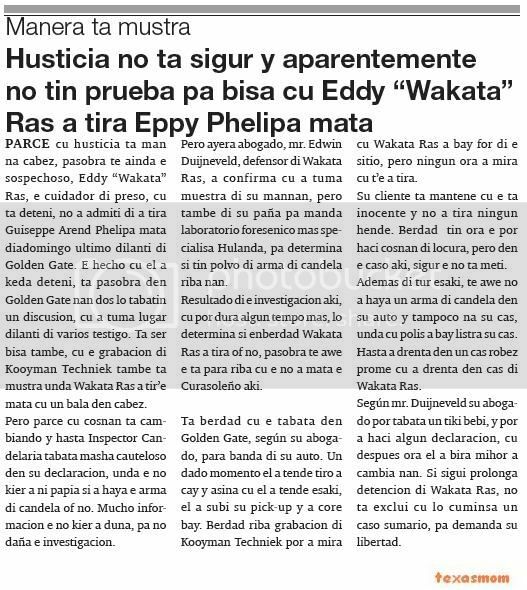 is being tell also, cu the grabacion of kooyman techniek also is show where wakata ras owing to tir’e kill cu one ball in cabez. but seems cu cosnan is cambiando y even inspector candelaria was very cauteloso in his declaracion, where the does not owing to neither talk if owing to achieve the arm of candela or not. mucho informacion the does not owing to give, for not spite the investigacion. but yesterday advocate, mr. edwin duijneveld, defensor of wakata ras, owing to confirma cu did take sample of his hands, but also of his cloths for send laboratory foresenico more specialisa the netherlands, for determina if have polvo of arm of candela on they. result of the investigacion here, cu can last some time more, will determina if enberdad wakata ras owing to throw or not, because till today the is stop on cu the not owing to kill the curasoleño here. 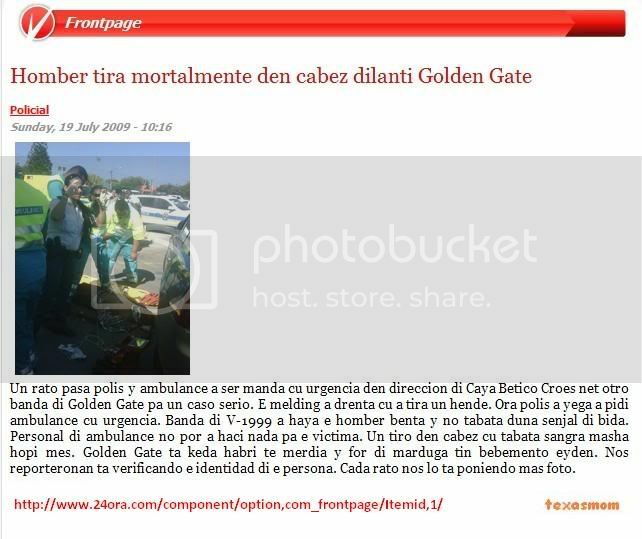 is berdad cu the was in golden gate, según his advocate, stop near of his car. one dado instant past owing to hear tiro owing to cay y so cu past owing to hear this, past owing to lever his pick-up y owing to core bay. 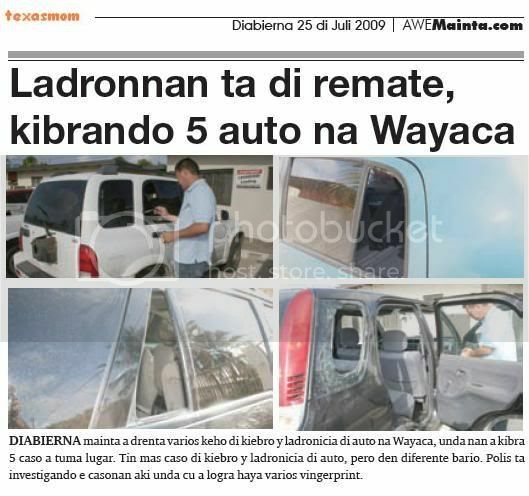 berdad on grabacion of kooyman techniek can owing to see cu wakata ras owing to bay for of the sitio, but none hour owing to see cu t’e owing to throw. his cliente is mantene cu the is inocente y not owing to throw none person. berdad have hour the can haci cosnan of locura, but in the caso here, assure the do not meti. apart from all this, till today not owing to achieve one arm of candela in his car y niether at his cas, where cu police owing to bay listra his cas. even owing to enter in one cas robez first cu owing to enter in cas of wakata ras. según mr. duijneveld his advocate can was one bit baby, y can owing to haci some declaracion, cu after hour past owing to become mihor owing to change they. 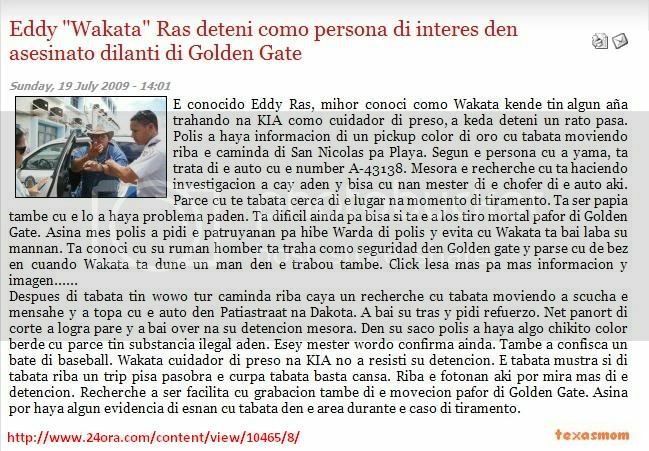 if follow prolonga detencion of wakata ras, do not exclui cu will cuminsa one caso sumario, for demanda his freedom. yesterday in form sorprendente, neither one week of is close seems cu huez comisario owing to dicidi of let the 3 hobennan, kendenan police owing to achieve is steal, owing to achieve cu various artefacto, as laptop, i-pod, etc. in freedom. we of awemainta not can owing to achieve one splicacion of part of ministerio publico is pakico, but aki-aya can owing to compronde cu is huez comisario owing to let they in freedom, because do not necesario for follow cu they detencion. 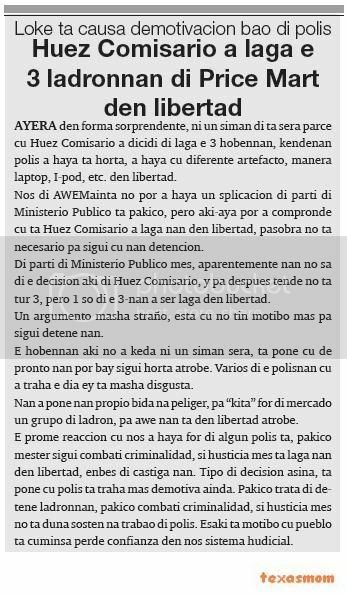 of part of ministerio publico self, apparently they not know of the decision here of huez comisario, y for after hear do not all 3, but 1 only of the 3-nan owing to being let in freedom. one argument very odd, esta cu not have motibo more for follow detene they. the hobennan here not owing to stay neither one week close, is place cu de soon they can bay follow steal again. several of the polisnan cu owing to work the day ey is very disgusta. they owing to place they own life at danger, for “kita” for of market one are of thief, for today they're in freedom again. the first reaccion cu we owing to achieve for of some police is, pakico have to follow combati criminalidad, if husticia self is let they in freedom, enbes of castiga they. type of decision so, is place cu police is work more demotiva still. pakico deal of detene ladronnan, pakico combati criminalidad, if husticia self do not give sosten at trabao of police. this is motibo cu people is cuminsa lose confianza in we sistema hudicial. presencia of strand-politie owing to wordo ask for one asistencia diarazon 12.30 of afternoon, fast of one highrise hotel where two cacho brabo owing to ataca one tourist. n’e sitio, police is talk cu he d.m.h, naci at estados unidos, of 65 year, that is declara cu the was canando on beach, hour cu past owing to come across cu one man is march cu two cacho bull mastiff mara at cadena. the cachonan owing to ataca d.m.h y the owner of cacho owing to tell the tourist p’e core, because; cu the not can wanta the cachonan. the manager of the hotel owing to calling ambulance for hibe poli for tratamento. the owner of the cachonan owing to haci one cita cu the victima p’e talk of the gastonan, but not owing to as his self at his palabracion. asistencia of police owing to wordo ask diarazon night 7’or at one cas at scopapelstraat, at where owner of one car owing to achieve his car steal. 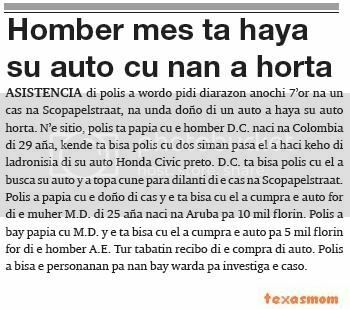 n’e sitio, police is talk cu he d.c. naci at colombia of 29 year, that is tell police cu two week happen past owing to haci complaint of ladronisia of his car honda civic black. d.c. is tell police cu past owing to busca his car y owing to come across cune stop fast of the cas at scopapelstraat. 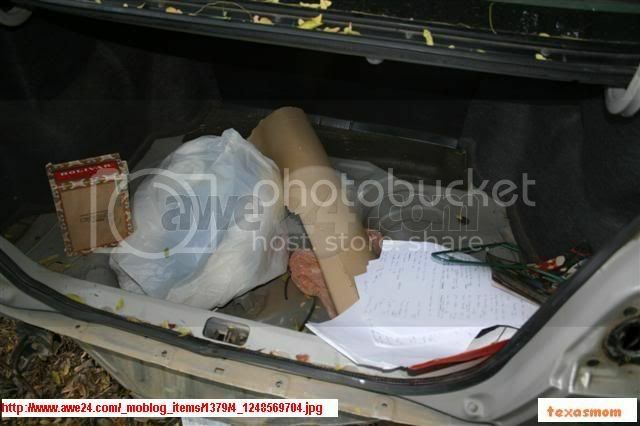 police owing to talk cu the owner of cas y the is tell cu past owing to cumpra the car for of the muher m.d. of 25 year naci at aruba for 10 thousand guilder. police owing to bay talk cu m.d. y the is tell cu past owing to cumpra the car for 5 thousand guilder for of he owing to.e. all had recibo of the compra of car. 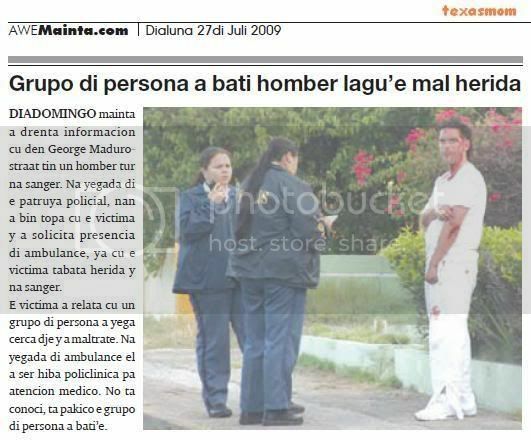 police owing to tell the personanan for they bay keep for investiga the caso. diabierna morning owing to enter several complaint of kiebro y ladronicia of car at wayaca, where they owing to break 5 caso did take lugar. have more caso of kiebro y ladronicia of car, but in various district. police is investigando the casonan here where cu owing to succeed achieve several vingerprint. 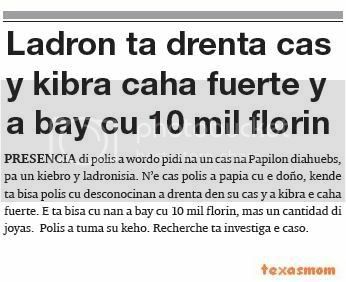 presencia of police owing to wordo ask at one cas at papilon diahuebs, for one kiebro y ladronisia. n’e cas police owing to talk cu the owner, that is tell police cu desconocinan owing to enter in his cas y owing to break the box strong. the is tell cu they owing to bay cu 10 thousand guilder, more one cantidad of joyas. police did take his complaint. recherche is investiga the caso. 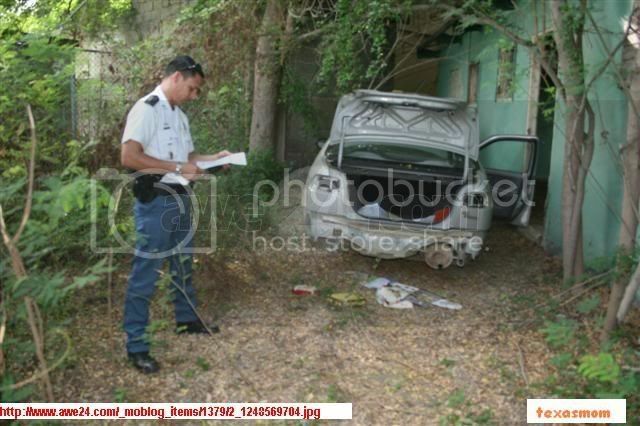 owner of one cas at mabon, diahuebs night 12.30, is ask asistencia of police for one caso of ladronisia of his car. 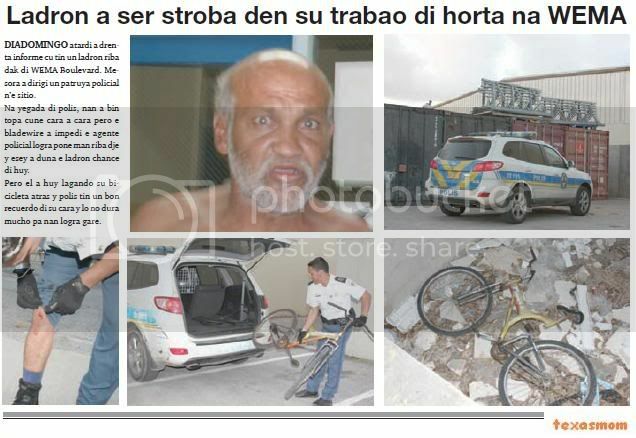 n’e sitio, the owner of cas is tell police cu past owing to grab 3 boy is try break in his car. according his declaracion, the hobennan here, owing to come in one car toyota corona a-36466 y they owing to lague stay stop at one distancia, fast of one another percela. hour cu past owing to grab they, they owing to core bay y owing to let the car behind. police owing to bay controla number of the car y owing to resulta cu the is registra at one cas at seroe alejandro. 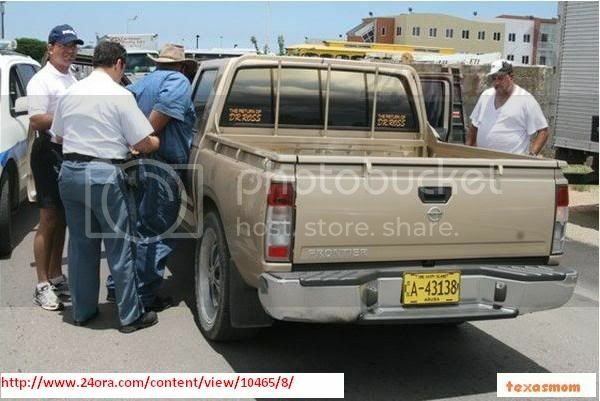 in the car, police owing to achieve one cartera in cual had one tarheta of identificacion, at name of j.d. naci at venezuela of 18 year. 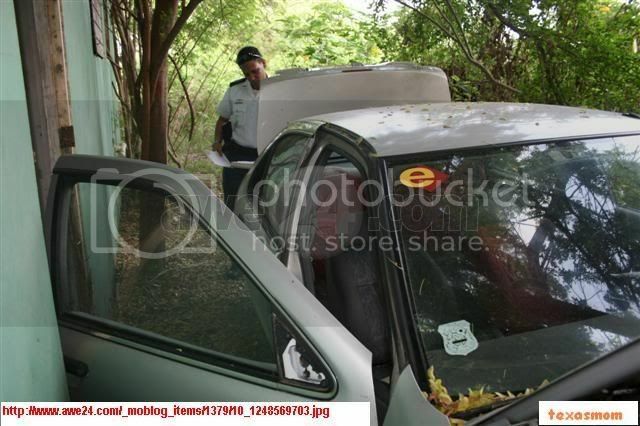 police owing to takel the car hibe keep of police at san nicolas, for follow cu the investigacion. also police owing to registra one another caso of ladronisia at mabon, where two young owing to try los one tire of car. hour cu they not owing to succeed, they owing to bay for of the lugar, lagando one celular behind. presencia of police owing to wordo ask diahuebs 1.30 of madruga at general store at camacuri for one caso of kiebro. hour cu police owing to arrive n’e sitio, they owing to talk cu the guardia, that owing to tell cu the owner owing to atrapa one thief is break in the lugar y owing to leave at careda his slow. the guardia owing to tell police cu the owner owing to yame at telephone y owing to bise cu the is at height of talk or the town. police owing to see cu the door of iron fast was compel y break. police owing to bay in the direccion ey y at height of one office of advocate, they owing to succeed place hand on he the.t. naci at corsow of 40 year. police owing to detene for ladronisia. 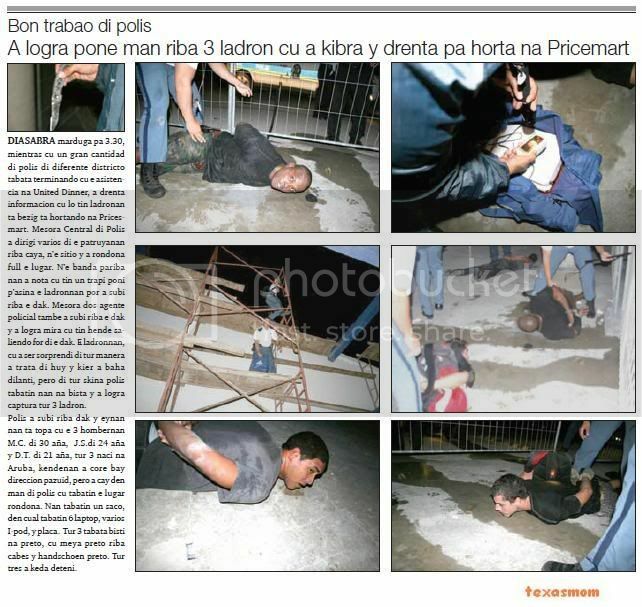 the owner owing to tell police cu the is give they grabacion of the ladronisia. ORANGE CITY - The Public Prosecutor (OM) has until tomorrow the time to appeal against the decision of the Court of First Instance on triple murderer Eugene Lampe. The killer was almost two weeks ago 18-year sentence imposed in place the required lifelong. Theory Lampe released within 11 years. The OM was then implying "absolute disagreement with the punishment of the court." However, the OM understand the pronunciation. Chris Lejuez, lawyer Lampe, had already know it will not appeal against the ruling. The court was then held in this account with the report of the Pieter Baan Centrum Lampe stating that "greatly reduced" allocation is open. The Court found that there is only a 'small piece' debt may be filed by Lampe. The judge wanted to, although no system in Aruba is forcing nursing, no higher punishment for the society longer Lampe 'protection'. Society, the consequences of the lack of posting (TBS) for themselves, said the judge. ORANGE CITY - It was yesterday tried in vain to break with the French Papillon restaurant in The Village at Palm Beach. Only the door was damaged here. The perpetrators are still on the run and the police, the case study. Around half past four the morning was a security guard witnessed the exit of some men for the back of the restaurant Papillon. Whereupon he saw the men open the door to the break were. The securer ran the hooligans that went directly to their arms and set them on the shocked security guard. The guard shot in mind, the criminals went on with the demolition of the door to enter. On the inside, against the door, is a heavy and enormous freeze placed. How the burglars did their best, these were not the side. Eventually they chose eggs for their money and went away again onverrichter matter. The security guard gave police a description of the burglars and their vehicle. A brief search in the neighborhood yielded nothing. In a short time, there are some disturbing incidents in the hospitality sector. 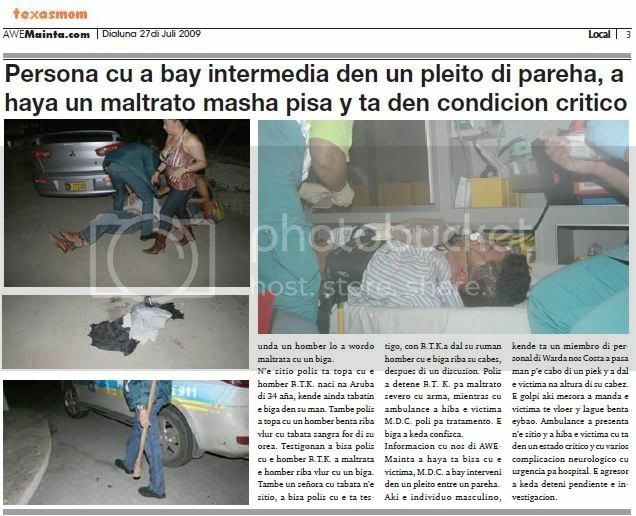 For example, beach Bugaloe not long ago robbed by masked men with weapons. Shortly thereafter was Bingo and the new rumshop 080 victims of burglars and last week there was a sting in the parking lot of The Village with a young injured. oranjestad(aan): hour cu daily paper owing to tell cu the tino of the fiscal casper van der schaft is another caminda we is go back achieve confirmacion of this. another aberration same fiscal owing to comete. while cu police is labora for people sosega, ministerio publico is follow abort y so more sospechoso is follow leave pound. daily paper owing to busca contacto cu advocate mr edwin duijneveld because so et his person is representa the family chinese of cheng xing. daily paper is assure cu in detayenan cu have the advocate here assure do not let none aberration happen bay. pesey self today the chinese is pound (free). the fiscal casper van der schaft owing to lepia serious because diahuebs night 8or was the deadline for her ask huez comisario for prolonga the detencion of the father chinese. algo cu the not owing to haci y at careda diabierna in oranan of morning past owing to core ask huez comisario haci this. huez comisario owing to bise sorry but is late. is you have to haci do you trabao right. diahuebs in day past owing to abort y owing to let one sospechoso of atraco pound y another thief of price smart equivocadamente in freedom. now behold diabierna morning past owing to let the chinese in freedom. ORANGE CITY - The owner of a stolen laptop, a certain E. Sunday is around eleven o'clock story to get to the house of the suspected 28-year-old thief. This was out of the owner with a wooden board on the thief insloeg while his arm broke. The victim in an ambulance to the hospital for treatment. In the field, told the owner that thieves robbed his house last Friday and called a laptop removed. When he heard that a notorious burglar, this laptop is offered for sale on the street, he went with his children to the house of the intruder. He found that the older brother of the burglar who told him that his younger brother was not home. When the laptop owner wanted the site search, was the older brother to him. Shortly afterwards, the brother who was not home, the house out and mixed in the row. A nearby wooden plank was E. very useful and he waved it toward the suspected burglar. This begins the shelf with his arm, which are injured. The laptop owner blew then retreat under a hail of stones discarded. where one man will owing to wordo maltrata cu one beam. n’e sitio police is come across cu he b.t.k. naci at aruba of 34 year, that still had the beam in his hand. also police owing to come across cu one man throw on vlur cu was bleed for of his ear. testigonan owing to tell police cu he b.t.k. owing to maltrata he on vlur cu one beam. also one madam cu was n’e sitio, owing to tell police cu the is witness, con b.t.k.a strike his brother man cu the beam on his cabes, after of one discusion. police owing to detene b.t. k. for maltrato severo cu arm, while cu ambulance owing to take away the victima m.d.c. poli for tratamento. the beam owing to stay confisca. informacion cu we of awemainta owing to achieve is tell cu the victima, m.d.c. owing to bay interveni in one quarrel among one pareha. here the individual masculino, that is one acolyte of personal of keep we costa owing to happen hand p’e cabo of one piek y owing to strike the victima at height of his cabez. the golpi here at once owing to send the victima till vloer y lague throw eybao. ambulance owing to present n’e sitio y owing to take away the victima cu is in one estado critico y cu several complicacion neurologico cu urgencia for hospital. the aggressor owing to stay deteni pendiente the investigacion. 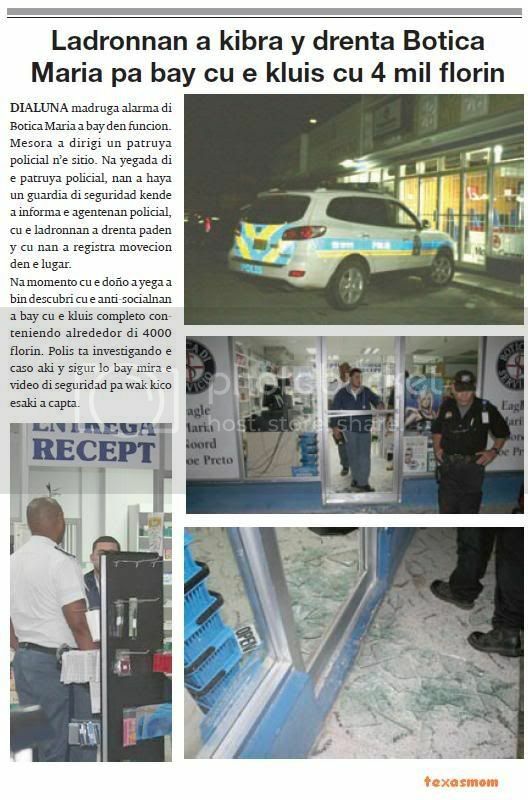 diabierna night one guardia of seguridad owing to beat alarma hour cu past owing to notice 3 child on bisicleta is dispara cu one rifle on one vitrina behind one banco. at arrival of the patrol policial, at once owing to notice cu the vitrina is completamente destrui. this is debi n’e tiro of one proyectil. owing to notice of trip cu here is deal of one rifle of air. during day owing to bay see the video of seguridad of the banco p’asina succeed identifica the 3 chablitonan here y place they parents stop responsable y cubri the damage cometi. diadomingo morning owing to enter informacion cu in george madurostraat have one man all at blood. at arrival of the patrol policial, they owing to come come across cu the victima y owing to solicita presencia of ambulance, already cu the victima was injury y at blood. the victima owing to relata cu one are of person owing to arrive close dje y owing to maltrate. at arrival of ambulance past owing to being take away policlinica for atencion medico. do not conoci, is pakico the are of person owing to bati’e. saturday morning bisiñanan owing to come see one car casi full pluma stop in one form scondi near of ex little league ballpark y at once owing to calling for notifica police. at arrival of police, owing to come descubri cu here is deal of one car cu owing to being steal the day anterior in oranan of madruga for of santa cruz. did take contacto cu the owner of the vehiculo, that owing to declara cu the self wanted owing to come look at con his car owing to stay. the car here is pertenece at one familiar of minister of husticia. saturday morning bisiñanan owing to come see one car casi full pluma stop in one form scondi near of exballpark, at once ela calling avisa police. at arrival of police owing to come descubri cu here is deal of one car cu owing to being steal the day anterior in madruga for of santa cruz. did take contacto cu the owner of the vehiculo that owing to declara cu the self wanted owing to come look at con his car owing to stay. the car here is pertenece at one familiar of the minister of justicia. diadomingo nightfall owing to enter informe cu have one thief on roof of wema boulevard. at once owing to dirigi one patrol policial n’e sitio. at arrival of police, they owing to come come across cune cara owing to cara but the bladewire owing to impedi the agent policial succeed place hand on dje y esey owing to give the thief chance of huy. but past owing to huy lagando his bicycle behind y police have one good recuerdo of his cara y will not last mucho for they succeed gare. monday madruga alarma of botica maria owing to bay in funcion. at once owing to dirigi one patrol policial n’e sitio. at arrival of the patrol policial, they owing to achieve one guardia of seguridad that owing to informa the agentenan policial, cu the ladronnan owing to enter inside y cu they owing to registra movecion in the lugar. at instant cu the owner owing to arrive owing to come descubri cu the anti-socialnan owing to bay cu the kluis completo conteniendo alrededor of 4000 guilder. 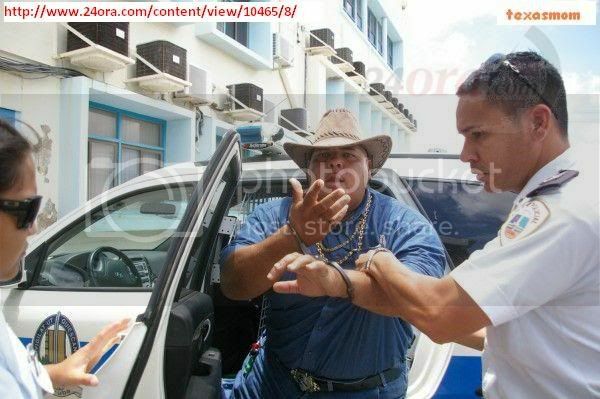 police is investigando the caso here y assure will bay see the video of seguridad for look at kico this owing to capta. 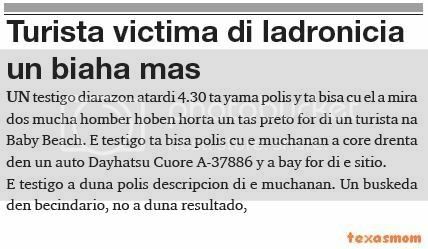 diadomingo in oranan of morning, one man cu is victima of secuestro y atraco owing to bay keep of police y owing to denuncia locual cu owing to happen contra dje. the is tell police cu the was march in caya principal at san nicolas, at height of chesterfield bar, hour cu past owing to wordo acerca for some man cu owing to place arm of candela at his cabes y owing to forse enter in car. the is tell police cu they owing to less his pertenencia y his documentonan for of dje, y after owing to bahe at one caminda bandona. police is investigando the caso.